It is so hard for me to believe that the princess will be here in less than two months! This pregnancy has seriously flown by! I guess it is because I am raising two very busy little boys too! However, I am slowly starting to get the supplies that I need to welcome her arrival, and a nasal aspirator is one of them! 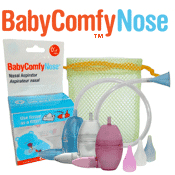 I was sent the Baby Comfy Care Baby ComfyNose for review recently, after I have been researching about this method of nasal decongestant for babies. I will admit, that at first I was grossed out by the concept until I watched the video and learned that you cannot get anything into your mouth by using this! The shape of the tool is made so that no secretions will get in your mouth, but if you need a little added protection, simply crumple up a tissue or toilet paper to work as a filter. I love that I can control just how much suction to use, and it definitely provides more suction that those cheap little bulb aspirators! I cannot wait to use this on the princess when she makes her debut in October! I also received the Baby ComfyGummi. I have used similar necklaces when both of my boys were teething and I just love the design. Mommy can look completely stylish and great, and massage babies gums at the same time. If baby gets to tugging in it tightly it will simply snap off of your neck because of the quick release snap. What makes this teething gummi different from others is the texture that it has! Not only does that make it look unique, but it is better at massaging sore gums! It is also made from Phthalate-free, BPA-free, PVC-free, Lead-free, FDA-approved and CPSIA-compliant medical grade silicon rubber. So, you can rest assured it is safe for your little one! Be sure to check out our Huge Baby Shower Gift Guide at the end of the month because we will be giving away the safer alternative to baby nail clippers, the Baby ComfyNail. the comfy nose is a LIFESAVER. ditch the moldy bulb syringes.... this takes the cake!